Winners Has Emerged from the Nigerian Tulip International Colleges, NTIC 16th NTIC Annual National Mathematics Competition for 2019/2020 Session - Enwere -Kingsley Ikenna, Declared Overall Winner with Sum Cash Prize of N300,000. The Nigerian Tulip International Colleges, NTIC has declared the winners of the 16th Annual National Mathematics Competition (ANMC). The competition, organised by National Mathematical Centre and Nigeria Tulip International Colleges (NTIC) Abuja, in Partnership with the National Mathematical Center, NMC Abuja was to reward hard work for pupils who devoted time to surmount the phobia associated with mathematics. Enwere-Kingsley Ikenna, 9, of Cuddy Kids School, Amuwo-Odofin, Lagos on Thursday emerged overall winner of the 16th Annual National Mathematics Competition (ANMC). Ikenna won gold medal, scoring 98.85 per cent to defeat 39,518 candidates who participated in the second round of the competition in the 36 states of the Federation, including the Federal Capital Territory. 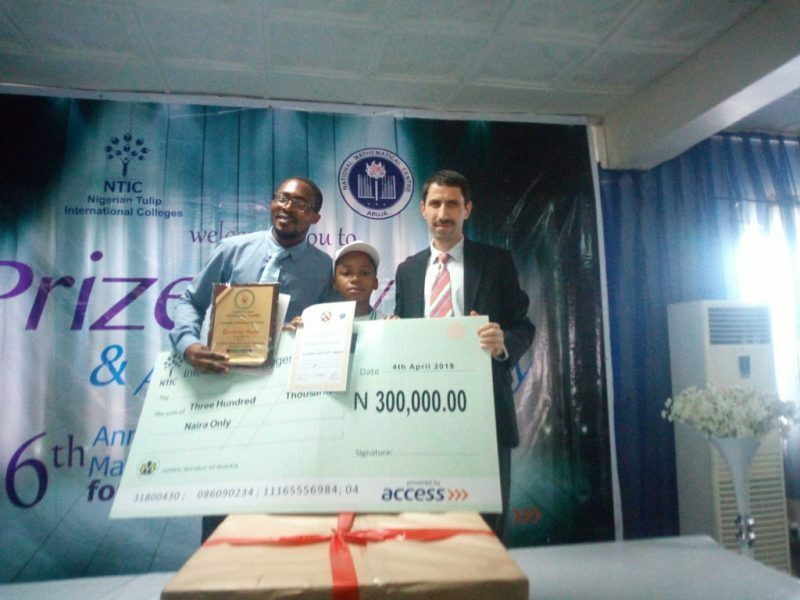 Ikenna gets all expenses paid full scholarship with N300,000 cash prize, while his teacher would get N200,000 and his school would get a digital printer and desktop. Pupils who emerged winners from second to seventh position would also get full scholarship from the college while winners from eighth to the twelfth position would get 100 per cent scholarship on tuition, among other prizes. The other top 11 finalist are Kayode Oluwaseyi-Emeka of Brainiacs Montessori Schools, Ogun, who emerged second position with 97.37 per cent and got a cash prize of N200,000, N100,000 for teacher, a digital printer and desktop for school. Daaron Okam, of Bridging gap Schools, Lagos, came third with 96.53 per cent with cash prize of N100,000, the teacher will receive N75,000, a digital printer for school, while Ayomikun Bello emerged fourth position. Adebayo joy of Petoa Nursery and Primary School, Ekiti, came fifth position with 94.89 per cent, Isabela Adubifa of Corona Schools, Victoria Island, Lagos, came sixth with 94.77 per cent, while Onwumere Ucheochukwu of St. Saviour School, Lagos, emerged seventh position with 94.06 per cent. Oluwalade Oluwademilade of Living Spring School, Lekki, came eight with 93.41 per cent, Esekhalu Ehinowu of Play Learn Academy bagged ninth position with 93.40 per cent while Adewale Ajayi of Migration Montessori, Ogun, emerged tenth position with 93.25 per cent. The winners emerged from the fourth to twelfth position also received various cash prizes which ranged from N75,000 to N25,000 for the least person and N50,000 to N20,000 for their teachers.